Speculative Food Design uses the tools of design to imagine and prototype alternative cuisines, future food systems and experimental ways of eating. In this paper we will show how Speculative Food Design can be used to inspire new products and services, critique existing food design practices or as a method for conducting ethnographies of eater experience. We will examine and compare two modes: Speculative Expressionist Food Design and Speculative Materialist Food Design, and provide examples of each mode from our own creative practice. We will present two projects where ethical considerations caused us to work between the two modes, depending on who was eating the food. Finally, we will propose ways that other practitioners can apply these processes in research, teaching or industry. Speculative Expressionist Food Design shares many qualities with critical design, design for debate and speculative architecture. By creating images, artifacts and experiences that present a viable simulation of a possible reality, audience members can think through the implications of what would happen if this fiction was real. This process is expressionistic because the images, artifacts and experiences are at the end of the day only mock-ups and props and no food is actually eaten. Audience members or research subjects may be viewers, or become performers, actively engaging with the food design scenario or installation. However they are not given access or allowed to eat the biological material because the food that is created is unsafe, inedible or simply doesn’t exist in biological / material form and can only be simulated. On the other hand, Speculative Materialist Food Design differs in that the prototype takes the form of food that can actually be eaten by the audience. 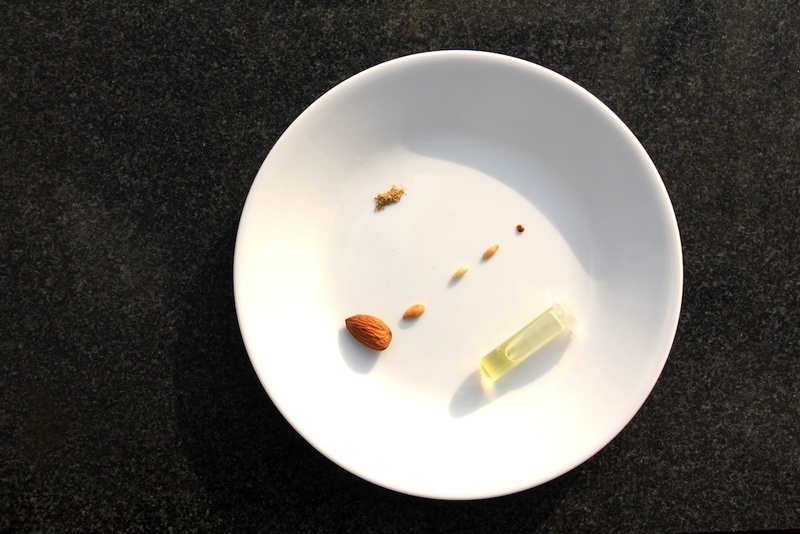 By seeking out novel ingredients / biotechnologies / cooking processes and serving them to an audience, Speculative Materialist Food Design implicates the eater directly in the imagined alternative food culture. These experiences remain experiments and are not necessarily repeated, or may not scale well for commercial or even artistic purposes, but can open up new pathways for receiving direct feedback from eaters. The emphasis of Speculative Materialist Food Design is creating simulated realities that provide access to actual genomes, biotechnologies or cooking processes, allowing audience members to interact with the material in the process of consuming it. Both processes are valuable tools for thinking through possible alternative courses and futures for food design, but each have limitations as well. We will provide templates for carrying out this kind of work in different settings, and discuss the artistic and ethical considerations when doing so. On Saturday evening Zack from the Center performed in a hybrid lecture/cook off. This was the menu he helped prepare. 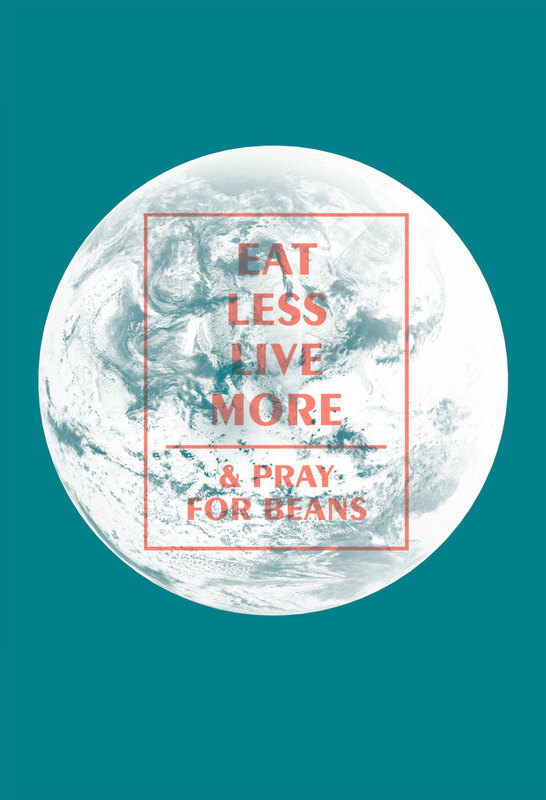 Cat and I have spent the last week putting the finishing touches on the cookbook that we are publishing as part of our DA4GA project called “Eat Less, Live More and Pray for Beans.” The file is in the hands of the printer (Ditto Press in London). We were excited to take advantage of Ditto Press’ 2-color risograph printer. What follows is a sneak preview of a few sections of the publication. In all of the images below, the orange is actually a neon ink and will show up very differently on the book than on these design proofs. Our thinking and writing during this project was highly influenced by the book Meals to Come by Warren Belasco. 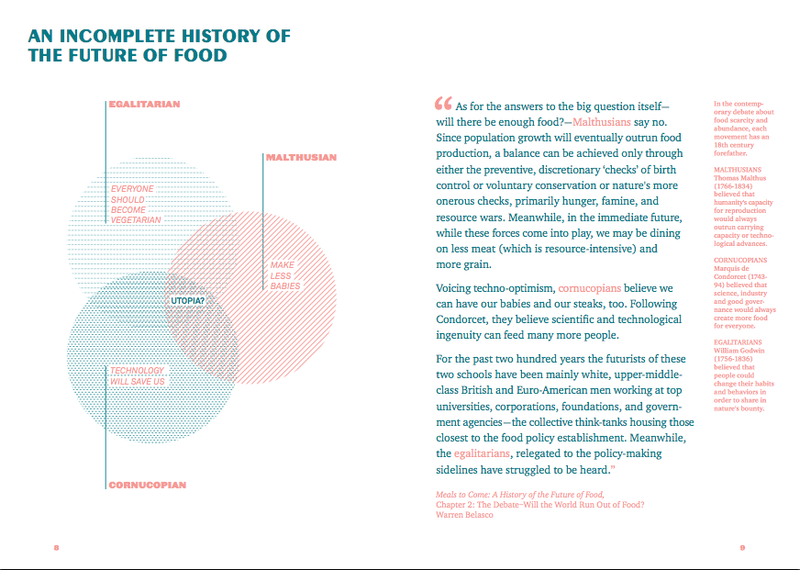 Here is one infographic from our cookbook that draws on his analysis of 200 years of Anglo-American food futurism. Early on in our research we spent of time looking for interesting stories from the many data sets about global and Dutch food. Here are some infographics of trends and changes that caught our eye. 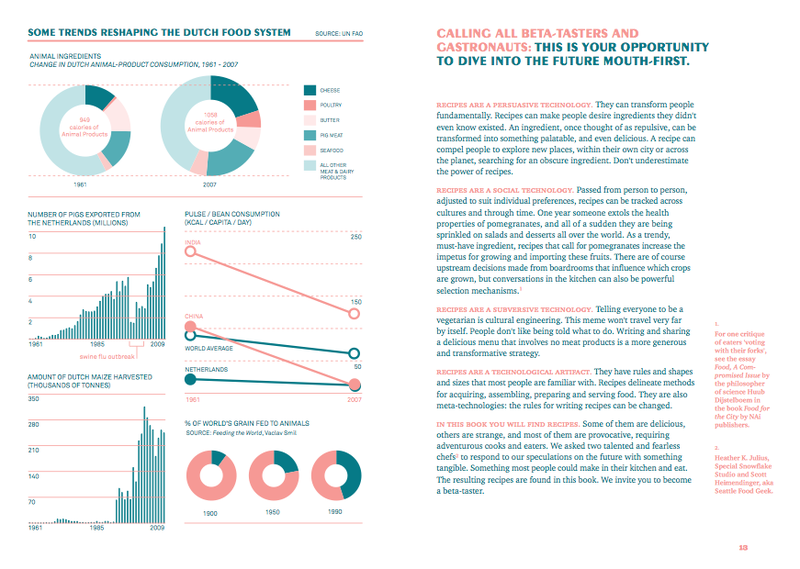 On the right-hand side is a short essay from the book called “Calling All Beta-Tasters and Gastronauts: This is Your Opportunity to Dive Into the Future Mouth-First.” To develop the recipes we worked with repeat collaborates Heather K. Julius and Scott Heimendinger. Both culinary creatives responded with some amazing recipes which we reveal on June 7th. When we spoke to Tiny van Boekel at Wageningen University we were quite amazed to hear about “MeatLess” a lupine-flour based product that can be used to make meat that is 80% meat and 20% non-meat. 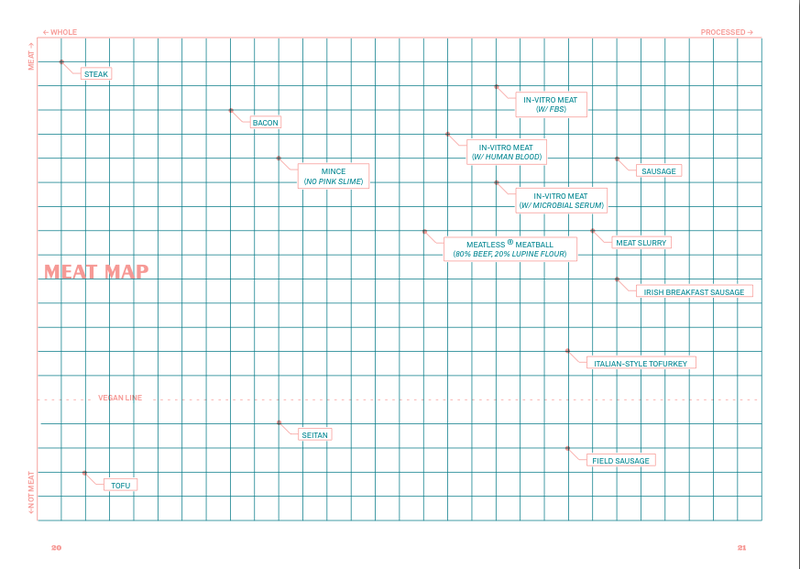 This conversation inspired our “Meat Map” so we could figure out where to put semi-meats on the spectrum. And finally, in the process of writing this cook book, we came to realize that we are always on the look out for unexpected ingredients. Now we have one more to add to the list: Maisantozwammen a mushroom grown on transgenic corn. 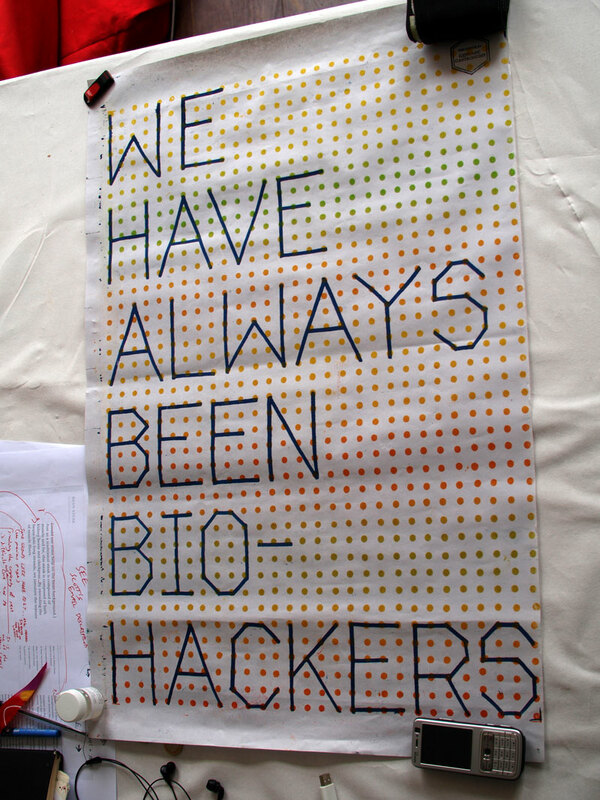 We are down to three “BioHacker” posters of our original 100 prints. Time for a trip back to Bangalore to make a second print run? It has been said that technology is the most human thing about us. Seed saving is a one of the oldest and most resilient human technologies. Seed saving is an environmental interface between humans and the plant world we are constantly co-evoloving with. 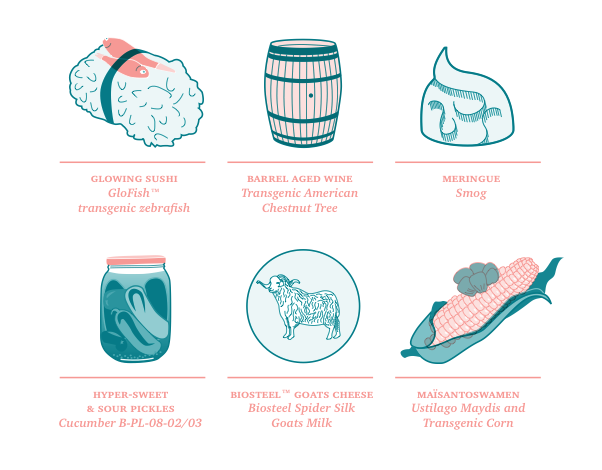 One of the greatest databases ever created is the collection of massively diverse food genomes that have domesticated us around the world. This collection represents generation after generation of open source biohacking by hobbyists, farmers and more recently proprietary biohacking by agronomists and biologists. I am still pretty happy with that description.